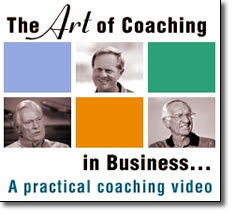 The Art of Coaching in Business DVD – Free Video Preview – Discount! The Art of Coaching in Business, 2nd Edition is a unique coaching video. It offers compelling and inspiring information from seven extraordinary individuals who understand the coaching process inside and out. The “stars” of the video aren’t actors reading a script about coaching. They are experts in the fields of business, sports, music and dance sharing their wisdom and experience about what it takes to coach successfully. Coaching requires our time and a shift in priorities. How do I get by-in for coaching? What actions do I take to coach? How do I provide feedback to improve performance? How do I coach someone who knows more than I do? How do I get the most from my people? What are the payoffs for the coach? Effective coaching is essential to building any successful organization. It’s the most powerful tool managers have to improve individual and team performance. Look behind any high-performing individual or team and you’re likely to find a skilled and committed coach. The Art of Coaching in Business will inspire all managers in your organization, from the shop floor to the boardroom, to learn and commit to using the coaching process to improve their associates’ performance. The DVD video is 20 minutes long and includes excellent support material including a Leader’s Guide, a Participant’s Guide and a Coaching Skills Survey.